Benchmark Foam is now able to service a wider range of roofing insulation needs with its lamination capabilities. Expanded polystyrene (EPS) foam insulation is used in many roofing systems for its low cost, stable R-Value and easy handling. However, because of a chemical incompatibility, EPS cannot be used in direct contact with polyvinyl chloride (PVC) membrane roofing. Until now. Combining EPS with a FR-10 fire resistant fiberglass slipsheet enhances the overall fire performance of the roof system and makes it compatible with PVC membranes. To comply with PVC roof requirements, Benchmark Foam laminates its EPS foam insulation to FR-10 slipsheets using a durable adhesive. Lamination combines two steps in one, allowing for easier installation once on jobsite. EPS can also be manufactured in several foil-faced options, if necessary for the job. Depending on the project requirements, adding a foil or film can offer a vapor barrier, fire retardant or improved thermal performance. 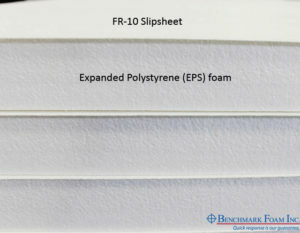 To learn more about ordering FR-10 laminated EPS insulation or other laminated, faced EPS, call our team at 800-658-3444 or 605-886-8084.